While this clause is relatively short compared to others in the Constitution, it gives enormous power to the President of the United States. While many of the President’s powers are tempered by the checks and balances of the other branches of government, the presidential pardon power in the Constitution is one of the least restricted powers of a president. While the mainstream population calls this power the pardon power, it is more precisely described as the clemency power. A pardon forgives a crime and usually comes after a person has served a sentence. Reprieves cover other clemency options, including commutation of a sentence or remission of fines. Like many aspects of the Constitution, the Founding Fathers borrowed from what they knew. The clemency power derives from the English prerogative of kings, first starting hundreds of years ago during the Norman invasion. The king’s power was absolute and the king would typically grant pardons in exchange for money or military service. As the years went by, the English Parliament attempted to reign in this power. In 1701, the English Parliament passed the Act of Settlement, which exempted impeachment from the royal pardon power. The Founding Fathers used this same idea. The President’s clemency power is similarly limited by the fact that he or she cannot interfere with impeachment proceedings. Preceding the Constitution, the Articles of Confederation touched on the clemency powers, but not much. State constitutions granted the clemency power to governors, in varying scopes. Governors continue to hold this power today and states vary on the procedure of how a governor grants clemency. As the Constitutional Convention began, neither of the two main plans, the New Jersey Plan and the Virginia Plan, suggested a proposal to give the President the same pardon power as the English King or state governors. There was talk, however, from some delegates and a suggestion that reason should be excluded from the presidential pardon power laid out in the Constitution. As tensions were running high during the revolution about loyalty to one’s cause or government, it is easy to see how this limitation was proposed. On May 29, 1787, Charles Pickney introduced a proposal to give the pardon power to the President. While many debated and argued, the presidential pardon was enshrined in the Constitution. While the Constitutional Convention was an exercise in hoping to create something different than the monarchy of England, it is curious that the framers decided to give the President a fairly unrestrained power. The first argument comes from Alexander Hamilton. Writing in the Federalist Papers, Hamilton stated that “humanity and good policy” require the framers of the Constitution to grant the president with the clemency power. The president can act as a force to mitigate the harshness of the justice system that existed in that time and still does to this day. The idea that justice is “blind” works in the sense that we hope that everyone is treated equally, regardless of their skin color or status in the eyes of the law. But we all know that this does not always reflect in practice. Likewise, the blindness of justice can create a harshness that the system is constricted by. Hamilton hoped that the presidential pardon power in the Constitution would give someone a chance to remedy this. Other notable legal figures have commented on the clemency power and the reasoning why we allow the President to hold this power. Chief Justice John Marshall in United States v. Wilson (1833) stated that the “pardon is an act of grace”. Justice Oliver Wendall Holmes stated in Biddle v. Perovich (1927) that he believed the pardon is not a “private act of grace,” but “part of the constitutional scheme.” James Wilson, a delegate at the Constitutional Convention, believed that the pardon power could be used for more pragmatic means, like persuading someone to give testimony against an accomplice. In practice, the clemency power arguably has been used in the way it was first designed to. President George Washington used it to temper emotions by pardoning the rebels during the Whiskey Rebellion. President Abraham Lincoln pardoned soldiers who went AWOL during the Civil War. President Jimmy Carter pardoned those who fled the United States or “dodged” the draft after the Vietnam War. Perhaps one of the most curious clemency grants came from President Harry Truman. He commuted the death sentences of Puerto Rican nationalists who attempted to assassinate him before the new Puerto Rican Constitution was adopted. Supposedly, this was to keep friendly terms with the U.S. territory. It is unknown if any of the framers would dream that some uses of the presidential pardon in the Constitution would become some of the most extremely controversial political moments in presidential history. The most famous presidential pardon was handed down by President Gerald Ford. President Ford pardoned President Richard Nixon after the resignation of Nixon as a result of the Watergate scandal. President Ford stated “My conscience tells me that only I, as President, have the…power to firmly shut and seal this book.” At the time, many were outraged by the actions of President Ford. As time has passed, we can see the idea Hamilton preached, “humanity and good policy” in President Ford’s pardon of President Nixon. If President Nixon was not pardoned, there would have been a public trial of a U.S. President. Good policy would suggest that this would have a detrimental effect on the country, not just with other countries in the world, but would also create divisiveness within the U.S. public. However, the immediate impact was not one of understanding. This pardon most likely cost President Ford the 1976 election to Jimmy Carter. 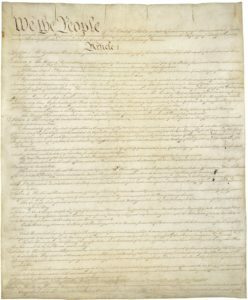 The Constitution firmly enshrined power to the President of the United States. The clemency power cannot be denied or reviewed by Congress. The pardon power in the Constitution is only held by the President. Currently, the Office of the Pardon Attorney in the Department of Justice provides the legwork for legal research on clemency petitions. This office then sends recommendations to the President. While this is a formal and administrative aspect, the President has no requirement to say yes or no or to even listen to the Office’s recommendations. The presidential pardon power in the Constitution gives the President one of the few times where he or she can truly act of their own accord.